Although Jiffy bags can be considered mailers, what we refer to as mailers or mailing bags are essentially polythene envelopes. 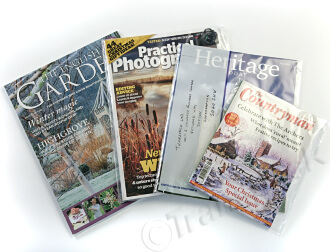 These quality postage bags all have flaps and sealing strips with a non removable adhesive. Bright Pink mailing bags, and.. 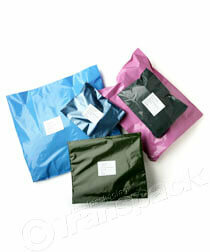 Dark Green (Knightsbridge) mailing bags. Can I get mailers printed? but printing on one or both sides is not a problem. Can I get special sizes made? Again, yes. Also subject to minimum runs of 5-10,000 depending on the bag size. The smaller the bag, the higher the minimum quantity is likely to be. Could I use these for small wooden kits? Not without some form of wrapping to protect the bag from the edges of the wooden parts. A Jiffy bag would probably be more appropriate. What weight will the opaque bags take? They will take quite a lot of weight, but if you then consider handling, throwing, dropping etc. I wouldn’t put more than 3 or 4 kilos into one. They are really designed for clothing, papers and other similar items. How thick are the grey & blue mailing bags? They are mostly 60 microns, the same as those you might get from well-known mail order companies. There are also a couple of heavy duty ones available. Can I stick a label or document envelope on the mailers? Yes. Most types of adhesive will stick to them well.